Before I move on to the slokas of Samkhy kArika and the summary, here is a brief explanation of the vrttis (energy vortices) of matter and organ systems of beings. Matter at the very basic is energy manifesting in different force-fields. Evolution of matter, which are non-living entities are based on five principles. At the very basic, a non-living entity or matter is particles manifesting in quantum force-fields (such as dirac-fermi field). This is called zero-point energy. This is Ananda. This is equivalent to the ‘signaling’ of life. This Ananda is equivalent to udAna in biological beings. Using this particle manifestation, different forms of stable matter evolve with some internal energy. This internal energy in stable matter forms allow the matter to interact with other forms of matter through chemical reactions. These chemical reactions are the vacana. This vacana is equivalent to prAna in biological beings. When a non-living entity using electric fields establishes chemical reactions with other entities, excess energy (called gibbs energy) becomes available, which is used in evolving more complex matter forms (such as organic and inorganic compounds, mixtures). This utilizing excess or available energy derived from chemical reactions with other entities is utsarga. This utsarga is equivalent to samAna in biological beings. When complex matter forms interact with each other and form more complex matter forms, due to pressure and volume differentials, matter forms move/circulate across the complete system. This circulation or movement of matter forms due to pressure, volume differentials is the ‘work done’ energy or the viharana. This viharana is equivalent to vyAna in biological beings. When entities react with each other and form complex matter forms using chemical reactions, it leaves out some energy that cannot be utilized at all. This unavailable energy that are left off from the entity is adAna. This adAna is equivalent to apAna in biological beings. 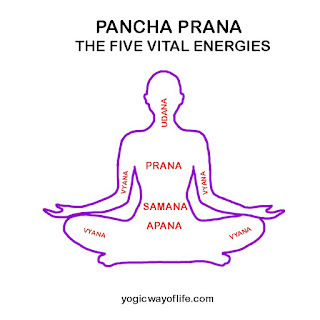 Matter evolution sustains on these five principles of udAna (zero point energy), prAna (Internal Energy), samAna (Gibbs energy), vyAna (work done energy equal to change in enthalpy) and apAna (Unavailable energy, change in Helmholtz, T*S).. But below all these is ‘At-Manas’, the extremely virtual. What drives the particle manifestations, chemical reactions, evolution of complex matter forms through interaction between matter, residues etc..? There is something ‘extremely virtual’, which do not obey the laws of the universe, that is ‘extremely off-the-shell’ and hence extremely virtual. This extremely virtual binds all that’s happening. This extremely virtual could be our knowledge gap, but yet without this ‘binding’ one can’t explain how this is being driven. We can take At-manas as the ‘nature’ of things. This ‘At-manas’ is the ‘Supreme Will’ and it is ‘Extremely virtual’. Thus udAna, prAna, samAna, vyAna and apAna define the evolution of universal matter and beings. At the very basic, Life is electric signaling. Electric and Chemical signals are at the foundation of any life. Chemical signals are also actually electric signals. The establishment of electric field mediated by virtual photons between different organs to facilitate signaling is life. The systems and processes by which this electric signaling is established is udAna. Using this electric field, a living entity evolves as a being with some stable internal energy. The stability of the being with internal energy enables interactions with other forms of matter or other living entities through chemical reactions such as oxidation. The systems and processes by which such chemical reactions like oxidation are established are the prAna. When a living entity using electric fields establishes chemical reactions for energy generation mechanism, it starts utilizing other such entities (living or non-living) for energy generation, through its energy generation mechanism. For example using oxidation, this entity can ingest/digest/utilize other matter or forms of matter to produce more energy. This more energy is utilized for the growth of the entity. The systems and processes by which other entities(living and non-living) are utilized for growth is samAna. When energy is generated in a living entity, using pressure and volume differentials, it is distributed/circulated to all parts of the entity, so that all parts of an entity utilize the energy generated. The systems and processes by which physical circulation of energy happens to all parts of the entity is vyAna. When other entities (living or non-living) are digested/ingested/utilized by this entity, the energy conversion is not 100% efficient. It leaves some residues and wastes. This residues and wastes are removed from the entity. The systems and processes by which this removal happens is apAna. 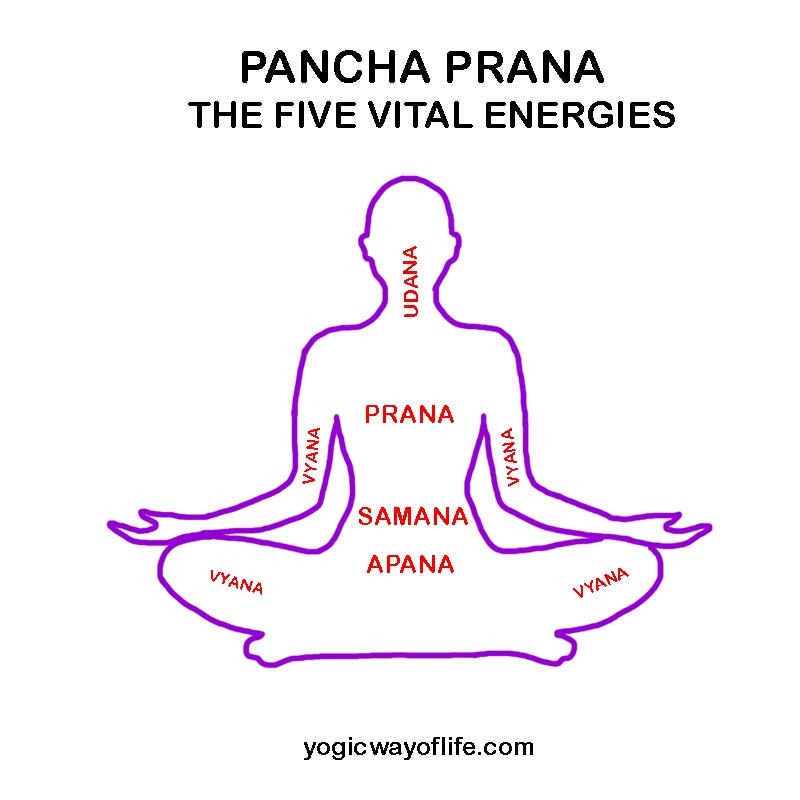 Life evolution sustains on these five principles of udAna, prAna, samAna, vyAna, udAna which processes the pancha-bhutas. But below all these is ‘Manas’. What drives the ‘electric signaling’ to happen between organs..? There is something ‘virtual’, which do not obey the laws of the universe, that is ‘off-the-shell’ in quantum mechanics parlance . This virtual binds organs of every living being and makes them a cohesive entity. This virtual could be our knowledge gap, but yet without this ‘binding’ one can’t explain how electric signaling takes root between compounds, how it is driven to evolve further. We can take manas as the ‘nature’ of beings. This ‘manas’ is the ‘Will’ and it is ‘virtual’. That's a great blog. And I think 'Manas' in the brain could be what neuroscience has come very close to. The interaction of genes with the environment, the epigenetic modification of genes (by which the basic structure of the genome doesn't change, but the way it behaves changes), free will (that inspires creativity) together is responsible for "personality". And 'free will' is a perception in a single component of the brain that evolves as we evolve our creativity to the next level. Hence, I strongly believe that free will cannot be explained without neuropsychological evolution (evolutionary neuroscience/psychology) which directly comes under the evolution of the Atman, the desire of the extremely virtual to evolve. This is what "Manas" may point to, is my understanding. As usual some great thoughts from you Sriram. 'Manas' cannot be located in any specific part of the body including brain. It is virtual. It is not real. It is something beyond the body. A virus has 'udAna', signaling pathways. But it does not have 'prAna' or 'samAna' on their own. Their 'prAna' and 'samAna' depends on the host. But virus as an entity with stable internal energy has 'manas', as something binds it and makes it work with udAna. A bacteria has udAna, prAna, samAna, apAna, vyAna etc. It has 'manas' that binds the molecules to make it work as an independent entity. The question of 'manas' has to be looked into like the question of 'vritual' particles in Quantum mechanics. It is 'off-the-shell', 'virtual', 'does not obey the laws of the Universe as we know it', 'knowledge gap', etc etc etc..
BAHUT KHUB LIKHA HAI APNE.